HOMANN -Arena Martis in Belgio qua provinciae X catholicae..
HOMANN,J.B. - Arena Martis in Belgio qua provinciae X catholicae.. Arena Martis in Belgio qua provinciae X catholicae.. - HOMANN,J.B. Size : 19.0 x 22.0 inches. / 48.2 x 56.0 cm. 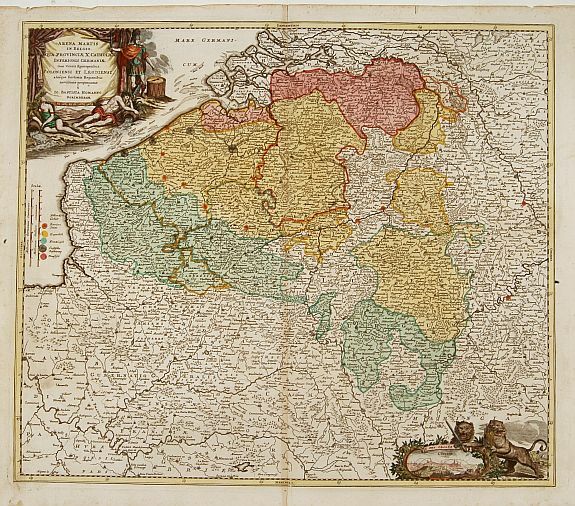 Description :"Johann Baptist Homann's well-engraved map of Belgium, southern part of the Netherlands and Luxembourg. With two fine decorative title cartouche, one with miniature panoramic view of Liège. Showing the territories occupied by the French, English, Dutch and Austrian. Johann Baptist Homann (1663-1724) was a German engraver and publisher, who established himself and his family as perhaps the most famous German map publishers. Following his death in 1724, the business continued under the name ,Homann Heirs,. This Homann map is finely engraved, and in original wash colour. Condition : Repair of split upper part center fold, hardly notable. Light brown spots in lower left margin, hardly affecting scale border. Dark impression.